I have my work and my passion. My art is not what I “do” it is who I am. There are no days off from being who I am, or doing what I do. Through my art, I honour and uphold all that I am as best I can, without compromise. 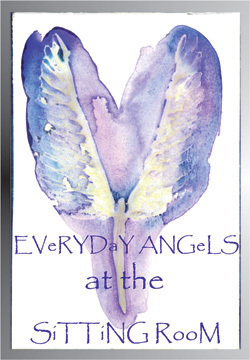 Welcome to the warm embrace of the Divine at the "Sitting Room", in the company of EVeRYDaY ANGeLS and Alison.
" I am so delighted to now be able to offer my services as an artist, for personal sittings. 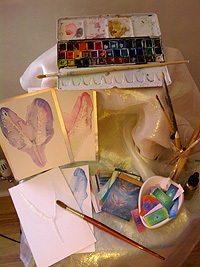 I will embody the expression of your very own angel through my brushes and paint box. The magic will simply flow! Each piece will be entirely unique; personal to you. All you have to do, is to choose the “unborn” angel you would like to work with, and I will invite you to a choose 3 angels from my own card deck, this forms the narrative of their message and then 3 of my own insirational word cards, which form the bridge. The angels and I will do the rest. When we are finsihed I will ask you to choose one of my special feathers to anchor the moment into your consciousness. the outer world will seemingly not exist. If you would like a personal consultation without the painting, I can offer 60 mins at £120 or 30 mins at £60. You will take away with you a channelled message written with my silver pen in violet ink on sparkley paper. You may return to the words of the angels time and time again for insiration, reassurance, courage and uncoditional love. I am also able to offer a Gift Voucher for those who would like to share the gift of a sitting . "Thank you for a beautiful and comforting experience, and for you added gifts x "
"Yet again you have created an experience to enable the wisdom of The Pearl to be revealed. Your very comfortable and welcoming Sacred Space moves beyond Time and allows a stillness, nurturing and sense of BEing held while your creative Magic happens. The end result; a delicate physical presence to quantify the experience in the form of a three dimensional painting giving a depth of colour and twinkle, together with words of Truth, Wisdom and Honesty gifting confirmation, encouragement and expansion of the mind to help magnify and expand intention. My thanks, love and gratitude go beyond measure." " The package arrived in the afternoon.my Angel is absolutely beautiful,the colours are perfect, they are my favourite by the way.I immediately fell in love with the painting.what a magical moment it was.Thank you so very much for this wonderful experience."